Before divorce became readily available in England, a common way to end an unsatisfactory marriage was to sell a wife at auction. 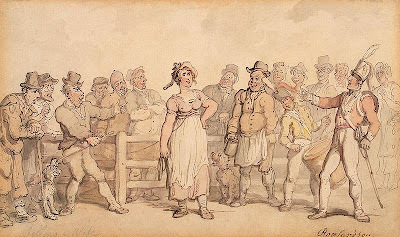 Usually, a husband would bring his wife with a rope halter round her neck, declare his intention to sell her (although often the sale was also announced in advance in the papers), and then he would auction her off. As awful as this sounds, wives rarely objected. In some cases, they actually insisted to be sold, as it was the only way to get away from an unhappy marriage. One of those scenes which are a disgrace to the police, lately took place at Spilsby. 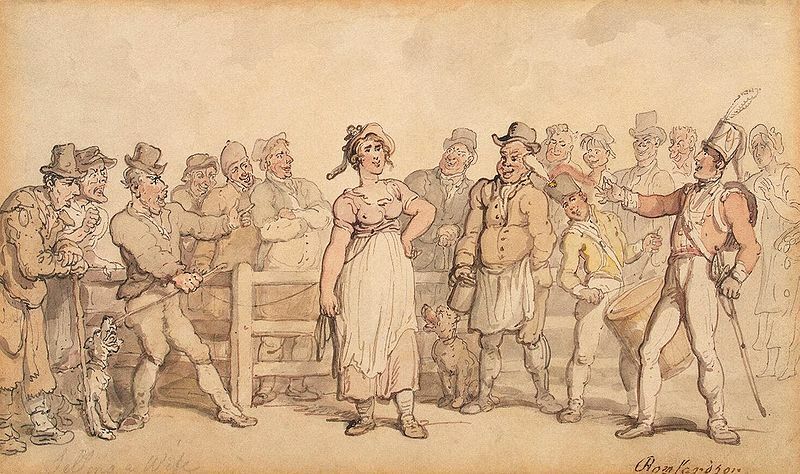 One Thomas Sowden, of Waiaflect, publicly exposed his wife for sale in Spilsby market, and sold her for five guineas, a larger sum than we have heard a wife to bring at a public sale for some time past. One of the engagements in this disgraceful bargain, was, that the husbaud should have the liberty of visiting her at what time he thought proper, with out let or molestation. After the conclusion of the sale the parties retired to a public-house, where for five days and nights they feasted upon the fruits of the bargain; but at length tired out by the powerful influence of Morpheus, like pigs, they all retired to the same style, certainly the fittest place for this unnatural trio.